Thank you for your interest in sponsoring San Diego State University’s Career Services office! Become a partner now! San Diego State University represents the heart of San Diego. It is the oldest and largest university in the region, and many factors make it the best source of professional talent around. But there can be challenges to recruiting at SDSU. With a student body of over 34,000 and hundreds of academic programs and student organizations, just finding your target populations can be daunting. Once you do locate students, getting them to hear your message and connect with you may be another challenge. By partnering with Career Services, you will benefit from our thorough knowledge of the SDSU campus and student body — and a network of connections we have continued to build over our 20-year history. 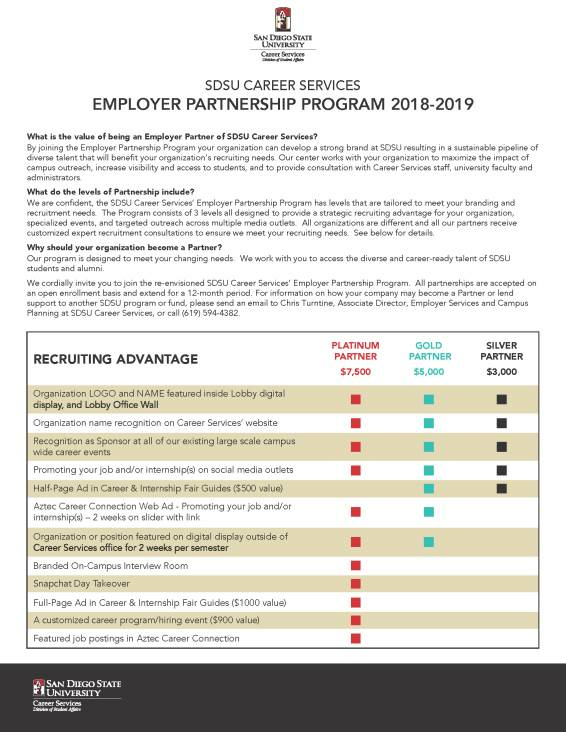 Partnering with Career Services for an annual sponsorship is the premiere way to amplify your recruitment efforts and build your brand into a recognized mainstay of recruiting at SDSU. We are eager to discuss your recruitment goals and work with you to meet them successfully because, in the end, a hire for you is a job for our students! 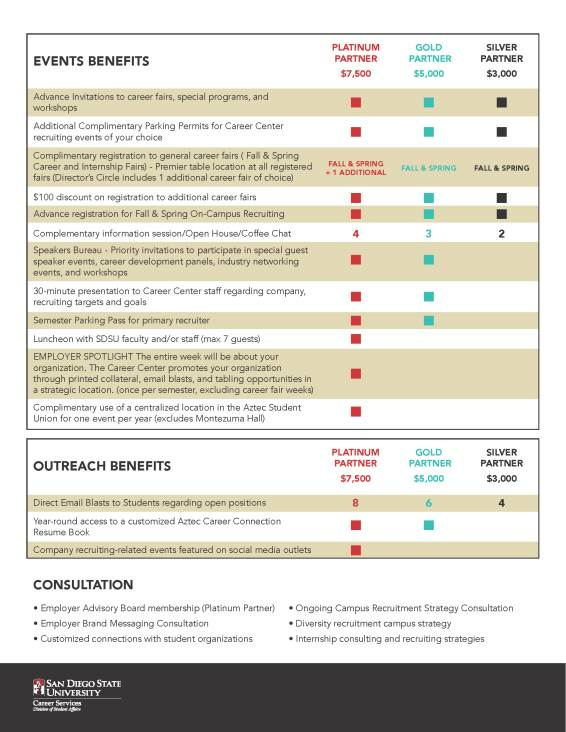 Contact Chris Turntine, Associate Director of Employment Services and Campus Planning, to discuss sponsorship possibilities: turntine@mail.sdsu.edu or 619.594.4382. We distribute the Career Fair Directory electronically each semester to students looking for internships and career positions. For more information, contact David Rodgers.